"P.C. Sorcar was a legendary Indian magician, much loved by his fellow countrymen. Now his son (Manick) is carrying on the the creation of 'magic' with a high tech edge." Manick Sorcar is one of the handful of animators who uses the cutting-edge technology of laser to do animation. What is unique about his work is that, he not only uses it for laser-lighting effects such as beams, fans, and tunnels - but also for producing life size animated figures that would interact with live performers on stage, through a technique called 'SorcarScope'. Animation with laser (Light Amplification by the Stimulated Emission of Radiation) is much more difficult than traditional animation. "...The sheer virtuosity of the finished product is so impressive, that when watching the swift whirling of Sorcar's laser animation, the viewer forgets the painstaking months of computer programming, research, sketching, and technical organization that are behind Sorcar's magic"
His laser shows are in general two types, the "Custom Laser Shows", and "SorcarScope" for his stage shows. Sorcar's custom laser shows are a unique blend of 2-D or 3-D animated laser figures along side spectacular laser light effects such as beams, over-head fanning, and tunnel effects with moving-head intelligent lighting. As an internationally award winning animator, Sorcar is able to custom design creative laser shows to fit any theme that may require complex animated laser figures along with various corporate logos and sponsor symbols. Over the past few years, his company has designed laser shows to fit almost any venue from art galleries, auditoriums, corporate special events to many others. Although Sorcar has been producing laser shows for many years now only recently has he developed a method of creating life size animated laser figures which interact with human actors on stage. 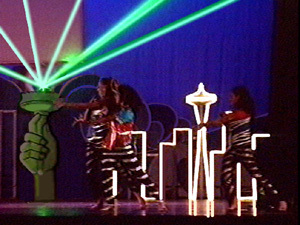 Dancing with My Soul is the FIRST laser animation that runs simultaneously with live dancing on stage through the technique called “Sorcarscope”. The life size laser figure interacts with it’s human counterpart as they communicate and dance with each other through music. Since then he has created other items on similar techniques which continues to push the limits of this technology. A brief history of his animation techniques and a behind the scenes look at how it all began.